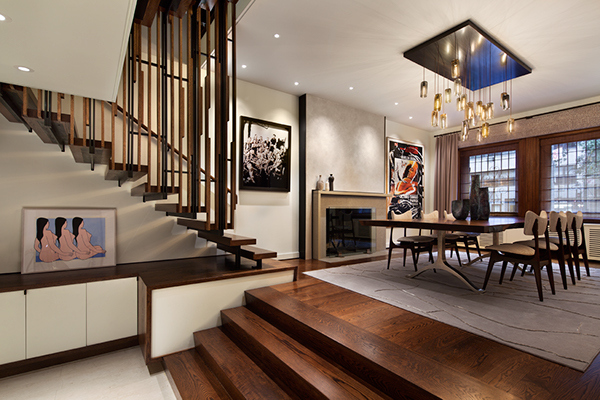 This renovation and combination of two apartments occupying several stories of an Upper East Side townhouse derived its design logic from the idiosyncratic sectional condition of the existing architecture. The original nineteenth-century structure was previously converted into separate units, a process that resulted in divergent floor levels on the north-facing (street-front) and south-facing (garden) sides of the building. The front of the townhouse retained the original, more expansive heights, whereas the floors added to the southern half resulted in a misalignment of levels between the units being combined. Within a limited square footage (roughly three thousand square feet), the apartment included six distinct floor elevations. The challenge was to reconfigure and integrate these discrete levels and separate units into a single functioning residence. Whereas the garden rooms, with their limited ceiling heights, received the private program, the grander spaces on the north facade provided the major public rooms, which retained much of the historical detailing and woodwork of the original house and allowed for the display of the owner’s collection of contemporary art. The zone between the divergent halves was conceived as a spatial joint or splice, negotiating the multiple elevations and interweaving the public and private circulations. 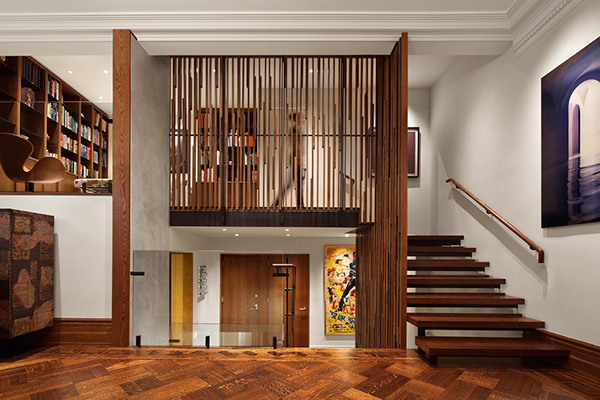 A series of architectural elements was introduced into this gap to stitch the floors together both visually and spatially, thereby reinterpreting and amplifying the vertical format of the New York City townhouse. 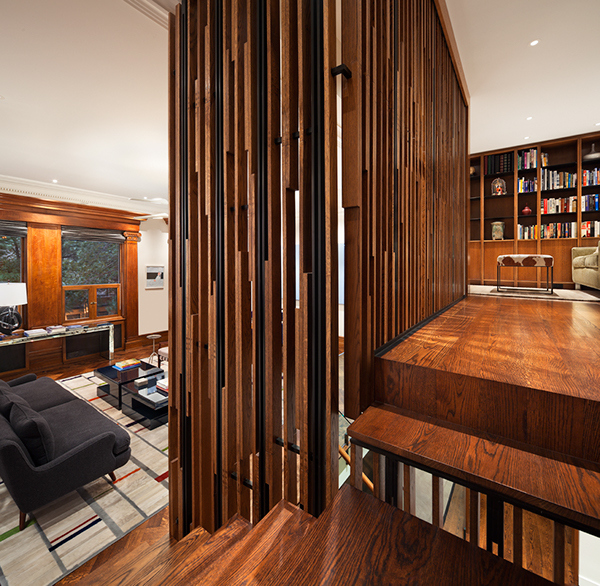 The primary feature of this interstitial zone is a slatted-wood and blackened-steel screen wrapped by an interconnecting stair. 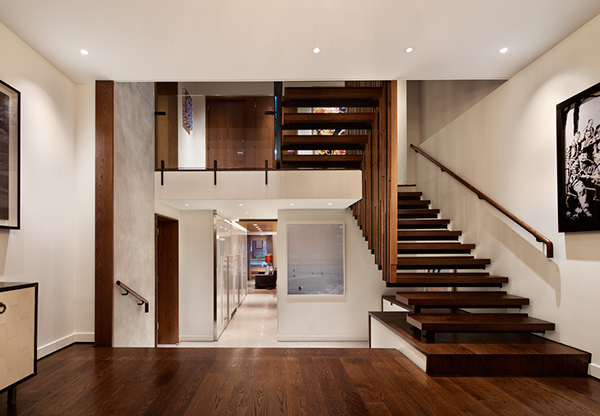 Partly cantilevered and partly suspended, the stair connects the lower-level dining area, formal entry, and living rooms, terminating in a suspended catwalk and mezzanine that form a small library. The stair and screen physically link the different levels of the public program while strategically arranged voids allow for visual transactions between the stacked spaces. 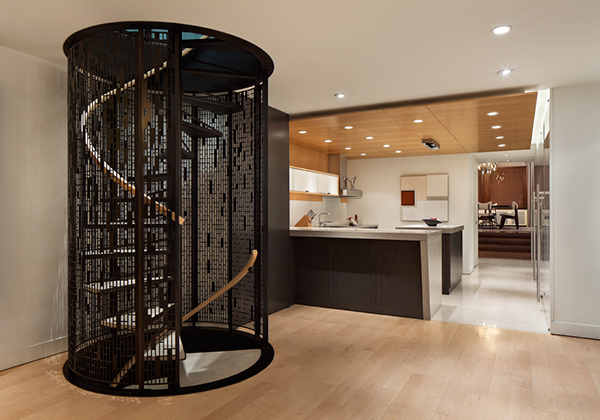 On the garden side, a spiral stair encased in a perforated steel cylinder similarly connects the private floors. The continuity of these vertical elements provides coherence to otherwise discontinuous and fragmented spaces.